The new Fiat 500L Wagon Diesel Estate looks like a stretched version of the popular 500 city car. This makes for a rather odd look, but it’s the biggest variant of the 500L and can seat seven people if you specify a third row of seats. Perhaps more importantly, all seven people should be fairly comfortable. The car’s boot is huge too, and this is a quirky and practical people carrier that’s very easy to live with. Read more about Fiat, from its inception in 1899 up to the present day in our informative article about the history of this Italian car manufacturer. OSV takes a closer look at what it’s all about with our 2018 Fiat 500L Wagon Diesel Estate review. This is a tall and long car, so it’s never going to be the most fun to drive. That said, it acquits itself fairly well on the road. Ride quality is fine in the main, although country roads will cause it to bounce around a bit. Body lean is minimal, and the overall driving experience is best described as predictable, safe and well-mannered – exactly the things that many buyers will be looking for. On the motorway, the 500L Wagon doesn’t feel terribly out of place, and it even feels at home. Indeed, it performs better at higher speeds than it does at lower ones. The light controls are simple enough to use and easy to get used to, and a City button greatly enhances its steering when you’re trying to negotiate tight urban settings. A big windscreen, meanwhile, affords you excellent visibility, which adds to your confidence. In terms of the engines, the diesels are the best bet for this car. A 1.6-litre MultiJet diesel engine has been around for a while and copes with the 500L’s weight better than any other power plant. Also available is a 1.3-litre MultiJet diesel that’s a bit of a veteran and feels too slow for this car. If you specify seven seats, it will really struggle. There are also petrol options available. A 0.9-litre petrol unit sits at the bottom of the range. It comes with a turbocharger and develops 105bhp. It’s a bit unconventional, however, and a tad slow. Next up is a 1.4-litre petrol engine that’s available with two power outputs. The 95bhp variant will likely be too underwhelming for most buyers, but a 120bhp variant is a good shout. Thankfully, Fiat haven’t just replicated the 500L’s cabin, but have attempted to distinguish the two models. 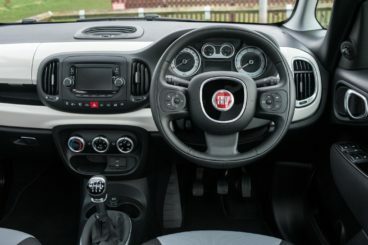 The 500L already has a top-notch interior, and Fiat have built on it here. The cabin is neat and tidy, stylish and well packaged, and the controls are logically arranged. Comfortable, supportive seats are also the order of the day, as is sound build quality. A soft suspension setup, meanwhile, ensures that ride quality is good for the most part. Insulation isn’t half bad either, with barely any tyre roar or wind noise making their way into the cabin. 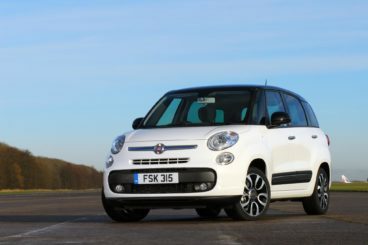 Is the Fiat 500L Wagon Diesel Estate practical? Five seats are standard but you can specify an extra two seats. Make no mistake, though, that while the car can ferry seven people around in relative comfort, it depends on the size of your passengers. For example, six big rugby players would not feel at home on an away trip in here! The extra seats flip out of the boot floor, and most buyers will use them sparingly. When you flip the sixth and seventh seats up, the boot measures 168-litres. Tuck them away and it measures 638-litres, which is a major improvement on the 500L’s 400-litres of boot space. Other than that, leg and headroom is good all-round and storage solutions are fine. Is Fiat a reliable brand? Read more about their reliability in our unbiased summary here. Standard kit is decent across the range, with the entry-level model coming with electric front windows, cruise control, air conditioning, buttons on the steering wheel, Bluetooth and a 5” colour touchscreen uConnect infotainment system. The Lounge model adds an electric glass sunroof, rear privacy glass, dual zone climate control, rain detecting wipers, dusk sensing headlights, all-round electric windows and an automatically dimming rearview mirror. Safety-wise, the car is yet to be crash tested by Euro NCAP. Its nearest sibling, the 500L, enjoys a 5-star safety rating, and we’d expect this one to follow suit. Standard safety kit includes traction control, anti-lock brakes, side and window airbags, while the likes of a low-speed collision detector is optional. Prices for the new car start at £18,945 and rise to £22,320. For more information on our leasing deals, you can check out our page here. In terms of its running costs, the cheapest engine to keep on the road is the 1.3-litre diesel. However, despite being able to return as much as 72.4mpg, it’s hard to recommend because it’s not really powerful enough to cope with seven people. That said, it emits just 104g/km of CO2 and has a BiK rating of 22%. The bigger 1.6-litre MultiJet diesel engine copes better with the car on a full load and still returns a respectable 67.3mpg economy. It also emits 112g/km of CO2 and has a BiK rating of 24%. It’s the one to go for if you need as much space as possible. It’s fairly cheap to both buy and run. It’s safe, predictable and works well on the motorway and in the towns and cities. To get those extra seats, you need to pay extra – unlike most of its rivals, which are standard seven-seaters. When the third row is folded, it measures a below average 400-litres. Let’s see how the car fares against its rivals in the comparison section of our 2018 Fiat 500L Wagon Diesel Estate review. The new Citroen Grand C4 SpaceTourer is one of the most stylish cars in this sector and it boasts a top-notch cabin. It’s a car that’s far from boring but at the same time, it doesn’t offer much by way of entertainment on the road. On the other hand, it’s a large car that’s easy to drive, with light steering, rear parking aids and massive windows simplifying your task. It’s also super comfortable, and once you’re up and running it’s clear to see that this is where Citroen’s chief focus lay. There’s lots of grip on offer, and it feels safe and predictable to drive. In terms of its engines, a 1.6-litre diesel unit sits at the bottom of the range. It develops a modest 99bhp and completes the 0-62 dash in 12.8 seconds. We reckon that might be too underwhelming for most of you, and a 118bhp variant of the same engine is easier to recommend. It covers the same sprint in 11.3 seconds and works well on the motorway. Meanwhile, a bigger 2.0-litre diesel that develops 148bhp might have more power but, despite a handy 0-62 time of 9.6 seconds, it’s hard to recommend. It requires lots of gear changes, which will get tiring. Running costs? The smallest 1.6-litre unit is able to return 74.3mpg on a good day and emits less than 100g/km of CO2. This gives it a BiK rating of 21%. The bigger variant of the same engine is good for 70.6mpg at best and has a BiK rating of 23%. The range-topping 2.0-litre diesel can manage returns of 68.9mpg economy, which qualifies it for a BiK rating of 24%. Inside, the Citroen is pretty groundbreaking. This is a top class, 5/5 interior that’s rich in quality. Large windows allow lots of light in, the soft spring suspension setup means you’ll be nice and comfortable, and the design is stunning. Citroen have been really imaginative with this one, mixing plastics, colours and shapes together to great effect. Indeed, we’d argue that the cabin looks and feels more upmarket than a so-called upmarket car! 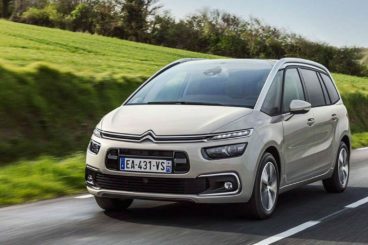 Is the Citroen Grand C4 SpaceTourer practical? It’s got plenty of storage solutions – some easy to find and others are hidden away – and, unlike the Fiat, it comes with seven seats as standard. A small glove box is a bit of a grievance, but two big lidded areas atop the dashboard make up for it. The boot, meanwhile, measures 165-litres with all seats up. Fold the rear seats and you can extend it to 2,181-litres. 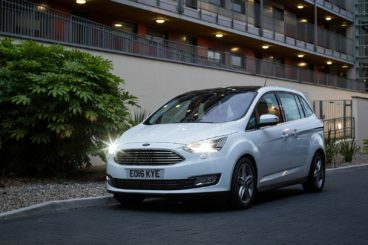 As its name suggests, the new Ford Grand C-MAX is the seven-seater version of the impressive C-MAX. Ford don’t do cars that are boring to drive. This might be a burly people carrier, but it’s very good to drive – the best in this class, in fact. In this way, it’s a lot different to your usual people carrier and it genuinely handles like a much smaller car. Body lean is kept to a minimum and the car is agile, stable and responsive. As a bonus, ride quality is good, too. In terms of its engines, there’s just the one diesel available. This is a 1.5-litre unit that produces 118bhp, and which has a 0-62 time of 12.3 seconds. It’s a good fit for this car, has a decent amount of pulling power and will sell well. It’s also smooth and quiet out on the motorway. Running costs? The sole diesel is able to average 64.2mpg economy, which is par for the course in this class. Emissions are pegged at 113g/km of CO2, and it occupies insurance groups 16 – 20. Inside, despite being such a sharp handler, the Ford is also pleasingly comfortable. We can’t see too many (if any) of your passengers complaining on longer trips, and this is what we all want from seven-seaters. Cabin quality is good, with Ford adding a number of soft-touch materials to the proceedings, and the instrument layout is a lot tidier than last time. Is the Ford Grand C-MAX practical? The biggest issue is the tiny boot. When all seven seats are up, it measures just 65-litres. However, that increases to a respectable 448-litres when you fold the third row of seats, and it has a total capacity of 1,715-litres. That makes it bigger than the Fiat but both cars are a long way off the Citroen. Other than that, leg and headroom is better in here than it is in the C-MAX when you use this as a five-seater. That said, it doesn’t always feel so spacious when the third row of seats are up and in use. The second row is roomy enough but you need to push them forward for anyone sat in the third row to feel moderately comfortable. Visibility is good, as is the driving position, and sliding rear doors are a handy inclusion. If you can get past its odd looks, this car can charm you. Pick the biggest engine, specify seven seats and you’ve got a spacious, usable and easy to drive family car on your hands. The Fiat 500L Wagon Diesel Estate is also affordable and its distinctive looks at least mean you’ll stand out from the crowd.